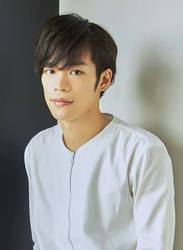 Kensho Ono has appeared in a number of anime series and is best known for his performances as Tetsuya Kuroko in Kuroko no Basket, Hakuryuu Ren in Magi, Mikaela Hykuya in Owari no Seraph and Slaine Troyard in ΛLDNOΛH.ZERO. This season, Mr. Ono is appearing in a number of shows including Prince of Stride: Alternative as Hozumi Kohinata, Luck & Logic as Yoshichika Tsurugi and Yu-Gi-Oh! Arc-V as Yuuya Sakaki. In addition to his numerous anime roles, Mr. Ono has also appeared in a number of Japanese television drama series and has dubbed a number of "foreign" films, and, notably, is the Japanese voice of Harry Potter.